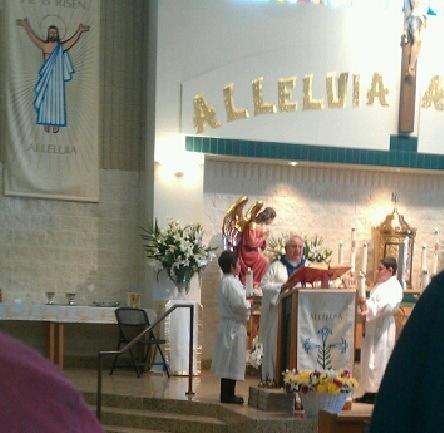 Yesterday, Nate served at Mass. He's been an altar server since September, and it's something that he enjoys. After Mass, we were waiting for Nate to change out of his alb and a man came up to me about the same time that Nate came up to me. He asked me, "Are you his mom? Is his name Nate?" I was surprised, but I answered "Yes!" It turns out that his wife had recognized Nate on the altar because she had watched some of the YouTube videos he has made about stuttering. She found the videos because she was looking through the NSA website to find out more information about stuttering, and noticed one of his videos on their site. We were able to meet his wife, and their 9yo son who stutters. (Their family also includes 2 daughters -- not to leave anyone out!) They seemed like a sweet, wonderful family and they were very excited about the conference in July and are hoping to attend. Without the NSA's website, it's unlikely we ever would have met this family that attends our church. Nate is the only child who stutters at his school, and their son is also the only child who stutters at his school. With stuttering only affecting about 1% of the population, it's not that easy to run into another person who stutters. Nate was nervous about being on the altar today. Even though he's served since September, he doesn't serve every weekend, and there are 5 altar servers at each Mass. He is much more comfortable acting as the crucifer than one of the servers on the altar. Today, it was as though he was meant to be there! I am so glad we met them, and hope that we have the chance to spend more time with them before the conference in July. It's always nice to see familiar faces, even though the faces at the NSA conference are some of the friendliest around! It seemed like a great way to kick off National Stuttering Awareness Week! And, now Nate feels like a bit of a rockstar!